(From left) CASNR Dean Steven Waller, IANR Harlan Vice Chancellor Ronnie Green, NCTA Dean Ron Rosati and IANR Associate Vice Chancellor Ron Yoder sign a 2+2 agreement between the College of Agricultural Sciences and Natural Resources at UNL and Nebraska College of Technical Agriculture in Curtis. Photo by Haley Steinkuhler/IANR Media. The College of Agricultural Sciences and Natural Resources at the University of Nebraska-Lincoln has signed a 2+2 agreement with the Nebraska College of Technical Agriculture in Curtis. This option will allow students to follow a curriculum track that will allow them to complete the first two years of their education at NCTA and then transfer to UNL to complete their final two years and earn a bachelor's degree. 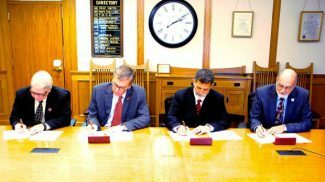 Institute of Agriculture and Natural Resources Harlan Vice Chancellor Ronnie Green, IANR Associate Vice Chancellor Ron Yoder, CASNR Dean Steven Waller and NCTA Dean Ron Rosati signed the agreement on March 18. "We have had a very long and productive history with NCTA that has evolved over time to one of the most innovative partnerships between a two-year and four-year institution," Waller said. "The result of these partnerships is expanded access and opportunities for students in the state interested in careers in agriculture." Evey Choat, a junior agricultural education major from St. Edward, completed her first two years of education at NCTA before transferring to UNL last fall. Everyone at both institutions made the transfer process easy, Choat said. "The transfer option provided me a great opportunity to be able to complete my four-year degree in the state of Nebraska," she said. NCTA is focused on tangible learning activities and hands-on education relevant to modern agricultural careers. NCTA was recently named a top 50 two-year institution by the Aspen College Excellence Program. For more information about NCTA, visit http://ncta.unl.edu. CASNR's goal is to prepare students as leaders for a future in which demands on food, energy and water systems will challenge sustainability. The areas of study span animal, plant and human health and well-being; earth systems analysis; agricultural production and processing; global climate change; agricultural market structures; water resources; and land-use change. The college also coordinates all agricultural sciences and natural resources programs in higher education in the state. For more information about CASNR, visit http://casnr.unl.edu.